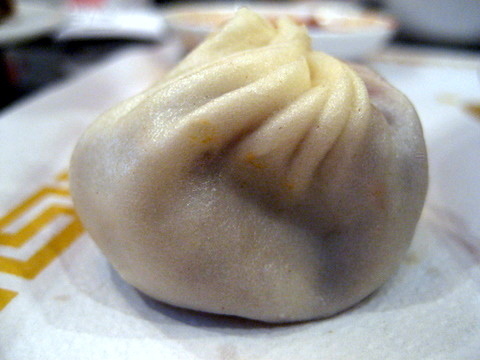 The name Ding Tai Fung has become a worldwide icon known for it xiaolongbao or as they call them in English steamed pork dumplings. 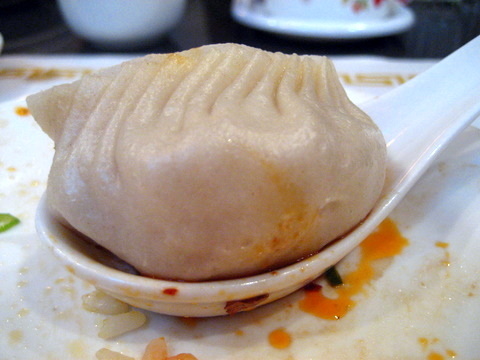 Ding Tai Fung was started as a cooking oil shop, but due to poor sales eventually switched to selling the dumplings they are so well known for today. To celebrate the end of our second quarter at Anderson a group of my classmates decided to go to Ding Tai Fung in Arcadia. The place has been so successful they actually have two locations in the same shopping center. The place is surprisingly well lit and clean, something not normally attributed to fast Chinese eateries. We ate at the newly opened location. 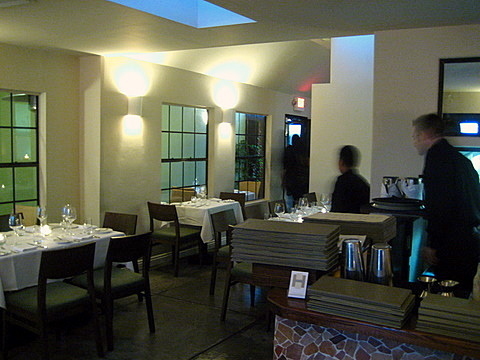 The restaurant is extremely long and narrow rather than the more balanced rectangular shape of the original. Upon entering one is greeted by a hostess. 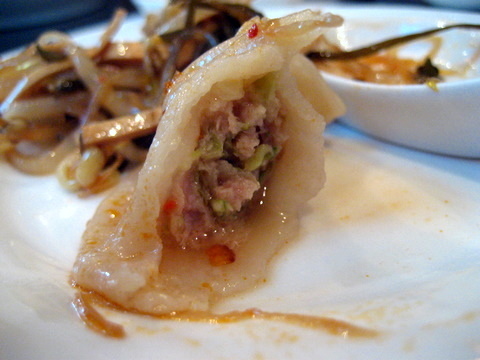 Nearby a large window gives diners a glimpse into the kitchen where a small army makes dumplings entirely from scratch. 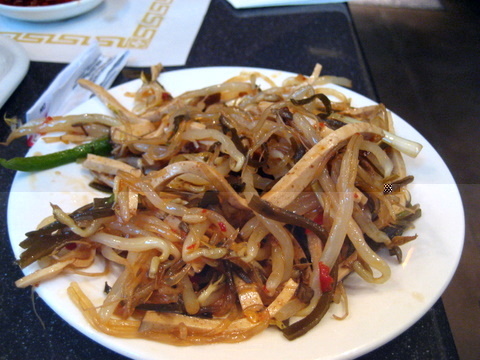 The appetizer plate consists of bean sprouts, seaweed, and dried tofu. Nothing special, fairly typical appetizer plate a bit of brine rounds out the seasoning. 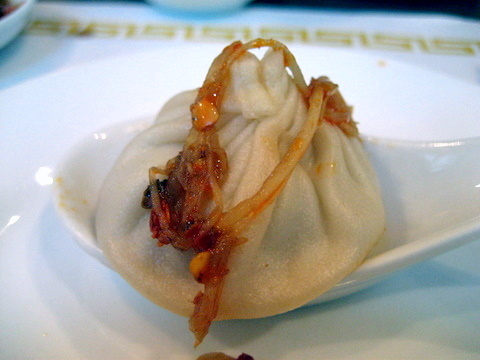 This is the world famous xiaolongbao. 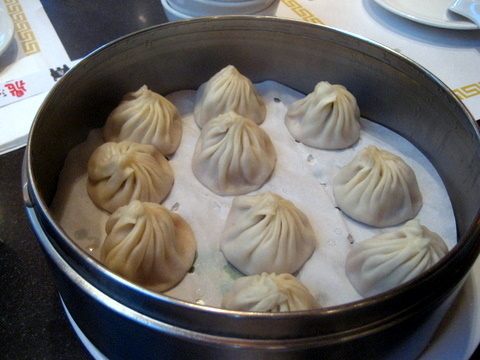 They come in a tin of ten, each freshly steamed and filled with scalding hot soup just waiting to burn the tongue. The flavor is fairly plain, and requires the addition of soy, vinegar and ginger to add seasoning. 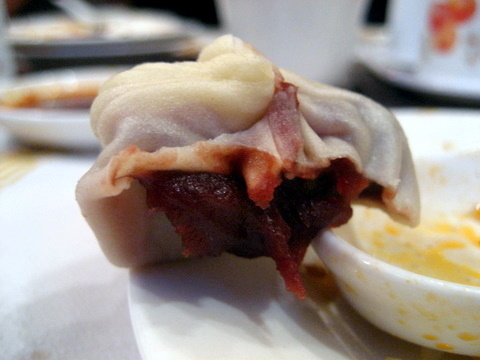 The texture of the skin is so soft, I was afraid I was going to break the dumpling just holding it. These are good but I don't think they deserve worldwide acclaim. 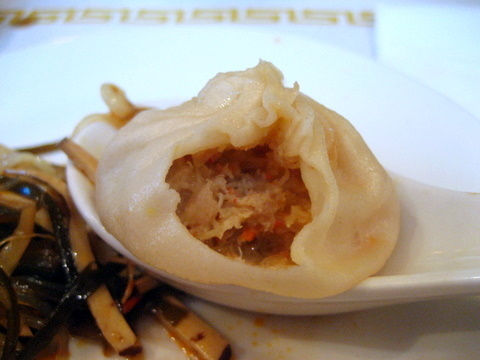 Honestly, I can't taste too much difference from the regular pork dumplings. 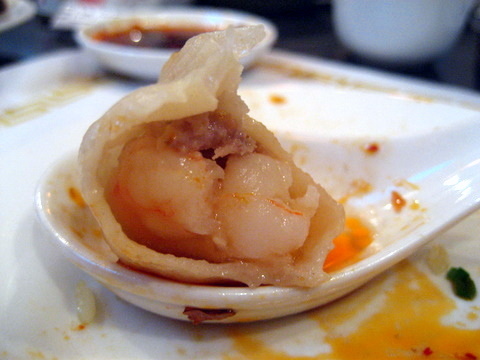 The crab dumpling flavor might be a bit fishier, the texture is slightly different as well with the meat being more stringy. 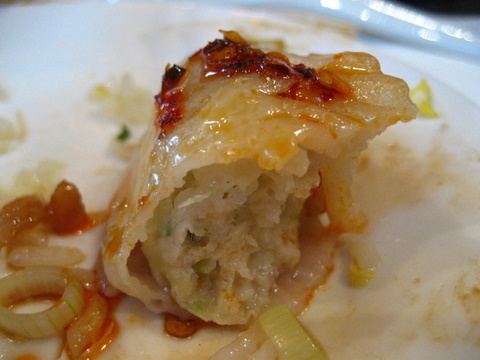 The most basic of dumplings, no juice, pork and vegetable stuffing. Personally I feel my mom's are better than these. Another favorite of mine at home. 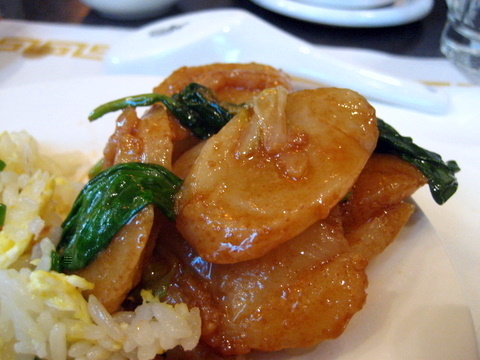 These sticky rice cakes are stir-fried and coated in sauce. I liked them but found the texture a bit softer than I enjoy. Surprisingly decent fried rice. 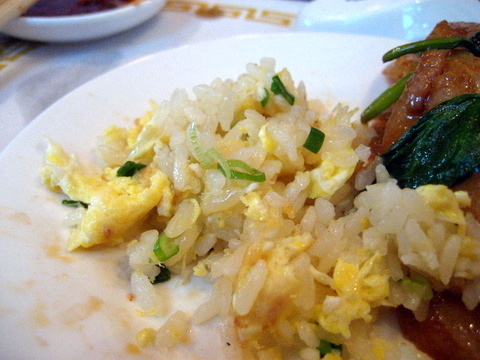 There was a sliced pork cutlet on top of a bed of fried rice with egg. Very simple flavors egg scallion and soy. In addition to the dishes pictured, we ordered some House Beef Noodle Soup and House Chicken Noodle Soup, neither of which I got a picture of. 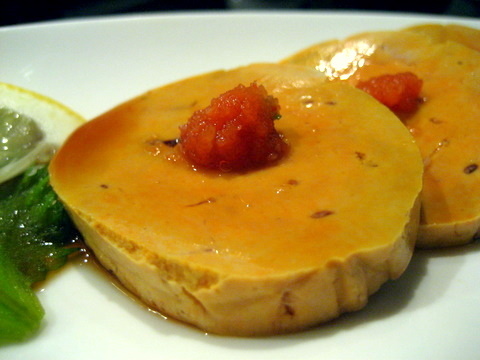 The restaurant is very good at its specialties. 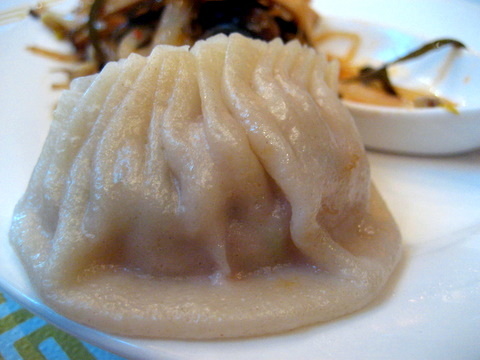 The dumplings do taste very fresh, the quality of the skin can attest to that. 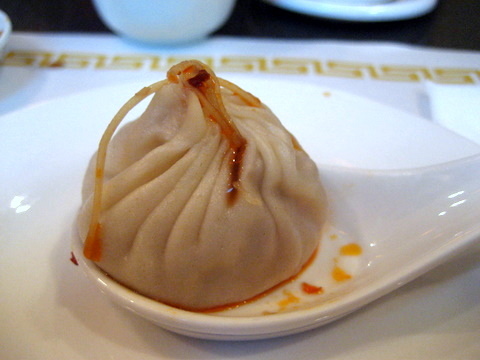 Personally I am not a huge fan of steamed dumplings and probably wouldn't make the trip out here again even if I did have a craving for them. The final in the recent series of dinners with my girlfriend. Sadly she had to return to med school and will be gone for at least 4 months. 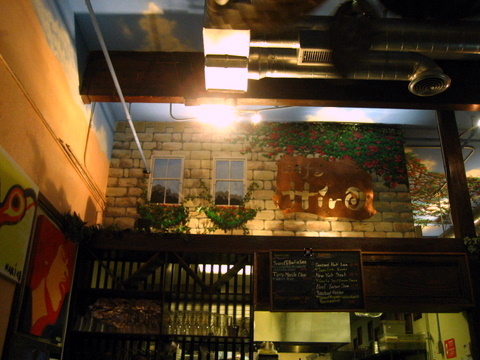 Surprisingly our last meal was at a fairly humble local eatery, Cafe Hiro. Reviews of the restaurant rave about the quality of the risotto and Chilean sea bass two of my girlfriends favorites. Located in a strip mall, the restaurant has a fairly nondescript exterior with a oddly-colored and strangely decorated interior. Given the name Cafe Hiro, one might expect the food to be Japanese-influenced and indeed it is. 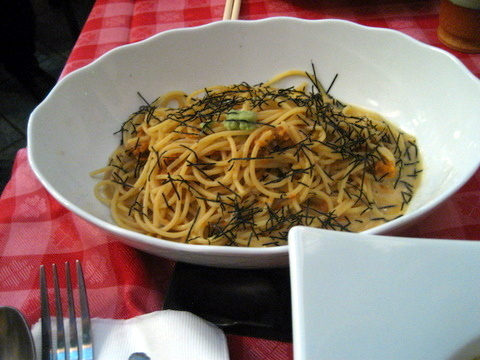 The restaurant specializes in Italian food pasta risotto and the like with a Japanese twist. 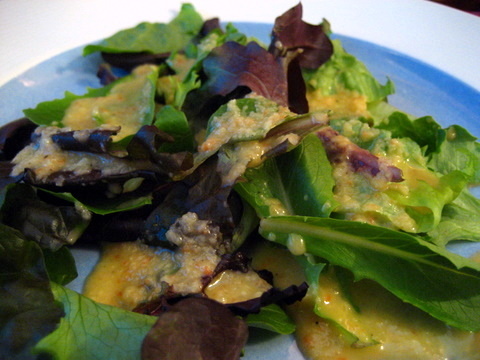 A fairly nondescript salad. Some greens a citrus dressing, I would have rather just gotten on with the main course. I believe this was some sort of potato cream soup. Scalding hot and mild flavor, fairly thin for a potato soup. Like the salad I could have done without this. 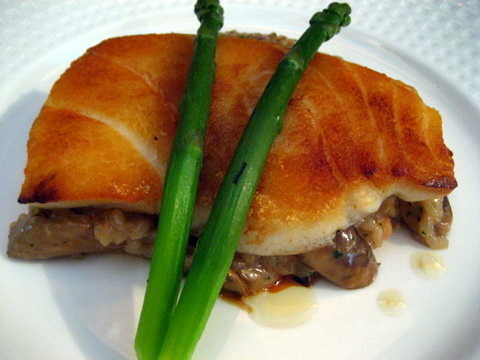 An interesting and pretty decent preparation of sea bass. No where near as soft and flaky as most. 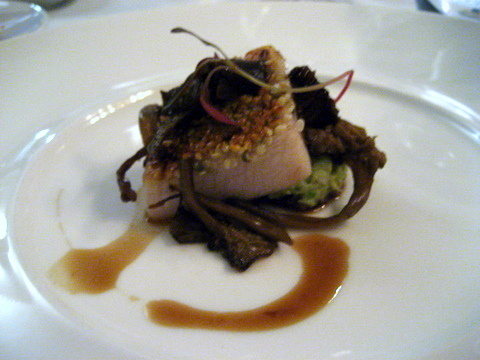 The fish also lacked the overpowering oiliness of Chilean Sea Bass, perhaps this is due to the cooking. I privately wonder if it is not actually Chilean Sea Bass, but it was good enough and cheap enough that I didn't really care. What surprised me was the risotto, the flavor was decent but the texture was more akin to rice than risotto. Good but just not what I expected. My girlfriend got this because the sweet corn risotto was a special for the night. 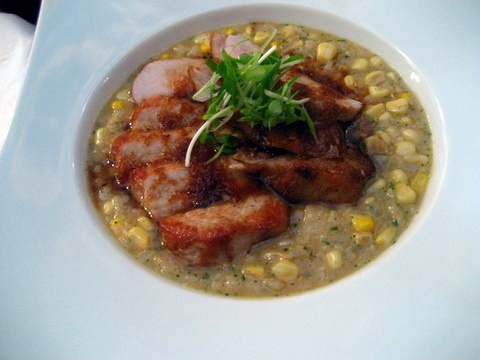 The pork cutlet was surprisingly tender, a bit sparsely seasoned the dish took on the sweetness of the corn risotto. Like the previous dish the risotto resembled short grain Japanese rice rather than true risotto. Surprisingly the best dish of the night. 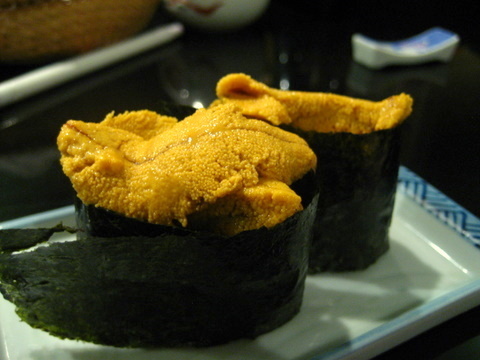 The uni wasn't as delicate and soft as what one would eat at a sushi restaurant but it doesn't need to be. Paired with spaghetti cooked al denté, the simple flavor of uni and toasted seaweed work much better than one would expect. 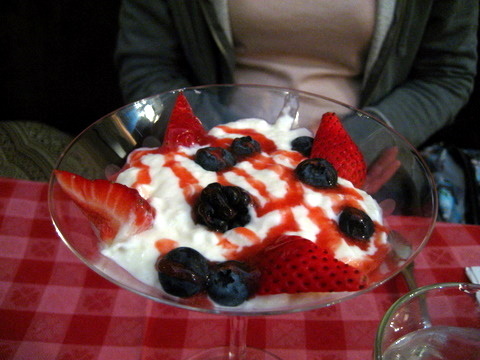 Unlike most panna cottas I have had this did not come as a single piece but rather looked more like a lumpy yogurt. I thought it was decent but lacked the complexity or flavor to stand up to some of the other panna cottas I have had recently. The food is fairly good for a local eatery, nothing spectacular but respectable. The biggest problem is the speed of the service. It took maybe 20 minutes before our order was even taken and another 20 to get the salad. I feel that is too long given we were hungry when we got there. I could see myself frequenting this place again if the mood strikes. I am not entirely sure what prompted me to choose Hatfields for dinner. Certainly the reviews had been strong enough, but personal testimony from friends had been wanting. In terms of decor Hatfields is quite plain, a non-descript facade, fairly spartan interior, and a little "outdoor" area that is little more than a cramped corridor running alongside the building. Originally we were given a table outside. We requested a table indoors and were shown to two small tables in the front of the restaurant. Initially, I was interested in getting the tasting menu, and fearing seven courses might be a bit much for my girlfriend, letting her do a la carte if she wished. Surprisingly the restaurant is inflexible in its tasting menu, not allowing substitutions and requiring the entire table to participate. The reason for this is the tasting menu tends to be a tandem tasting with 14 different courses shared between the diners. I ordered the wine pairing with my meal and I wonder if my girlfriend had done so would they have poured the same wines for her. I enjoyed the pairings but didn't bother to take down any notes. The deviled egg had a creaminess from the whipped yolk and a salty smoky flavor there was also a bit of tartness suggesting some sort of relish or pickle added to the mix. 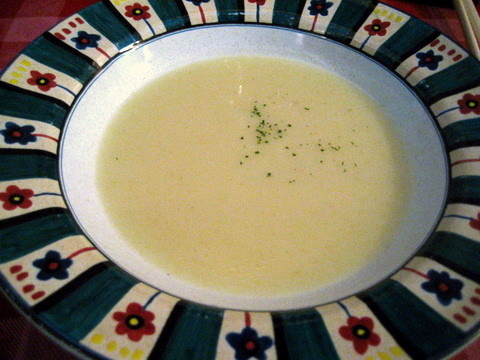 The cauliflower cream soup was in contrast much subtler with a bit of sweetness and a smooth creamy texture. This combination reminds me a bit of the amuse at Picasso. one intensely flavored small bite and a soup of some sort, warm thick texture and mild flavor. 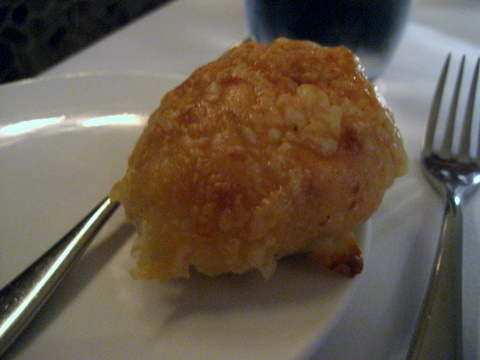 The bread was a warm roll topped with some sort of cheese, tasted to me like gruyere. The bread was warm to the point of being painful to touch with a light fluffy texture with a cheesy flavor. Being of simple bread tastes all I require is something warm and soft this met those requirements and then some. 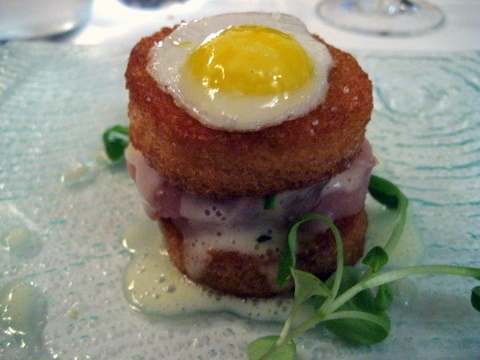 My first course was the Hatfields take on the croque madame. A croque monsieur which is basically a grilled ham and cheese sandwich and the switch from monsieur to madame is due to the egg on top which resembles a woman's hat. I thought this was a very nice starter. I particularly enjoyed the addition of raw hamachi to the mix which was lighter in flavor although somewhat similar in texture to the prosciutto. The brioche was warm and as a result of the grilling crispy and fluffy. 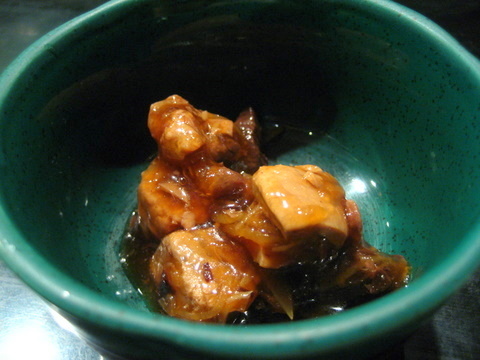 The second course consisted of cuttlefish mixed with maitake mushrooms, both of which have a slightly chewy texture. 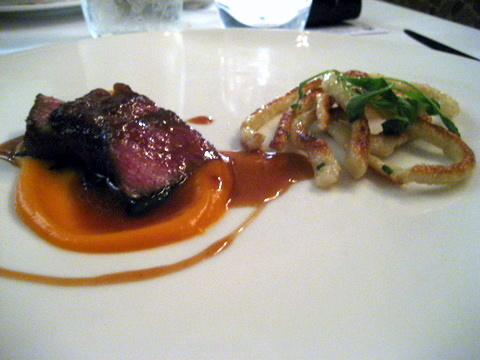 The maitake mushrooms gave a very earthy flavor which complimented the celery root pureé. 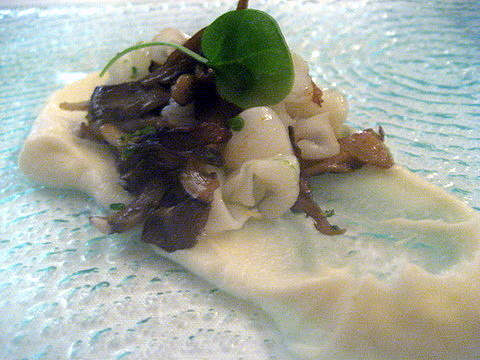 This was a very busy course combining the chewiness of the cuttlefish and mushrooms with a grainy pureé of celery root. I felt the dish was a touch salty, given the relatively mild flavor of the ingredients it stands to reason something would have to be added, I just felt they added a bit too much. Having octopus immediately after cuttlefish seemed a bit odd. In terms of accoutrements, the two were fairly different. 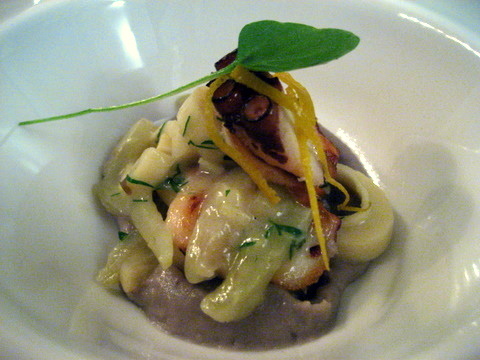 The octopus was paired with heart of palm which has a firm crunchy texture. The red wine olive pureé was far more pungent than the celery root pureé used previously. All things considered I felt this was a fairly weak course, the flavors each vied for attention rather than working together harmoniously. Unlike the earlier courses, I felt the flavors with the scallops were muted. 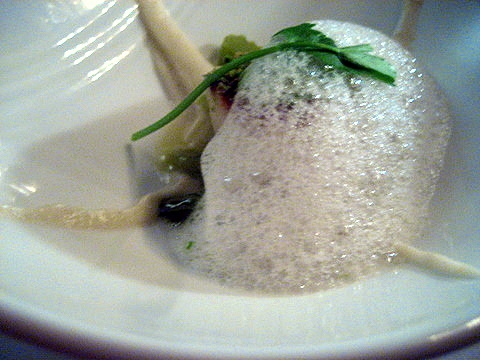 The salsify pureé had a flavor akin to an artichoke while the celery added a subdued bitterness and the apple froth adding only a whisper of flavor. Again with the pureé, the last four courses have had some form of pureé in it. Everytime I see this fish I think it is salmon. Its only when tasting that the differences become apparent. 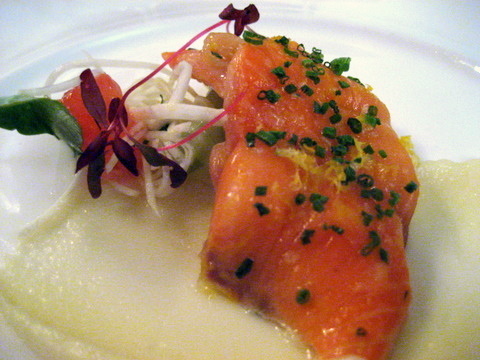 The trout has a much softer texture and milder flavor. Definitely the main flavor came from the smoked potato pureé. Another fairly disappointing course, the soft almost mushy texture of the fish mars the entire course. 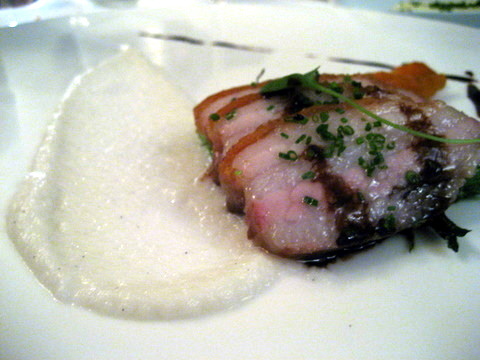 I liked this course, the hamachi collar was firm but moist, and full of flavor. The ginger helped manage the bitterness of the brussel sprouts while the citrus vinaigrette acted very much like a ponzu sauce normally used for dipping broiled hamachi-kama. About this point in the meal the courses started to improve noticably. The duck was well seasoned with the oils from the layer of fat resting between the crispy skin and the tender meat. The quinoa was similar to a rice but had a nutty flavor that went well with the savory richness of the mushrooms. 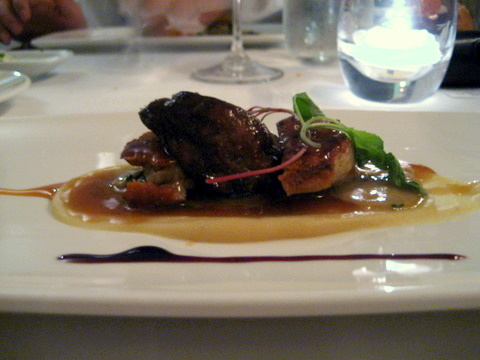 Cooked to perfection the tender chicken wing paired extremely well with the flavor of foie gras. Meaty mushrooms and a slightly sweet sauce pair well with the main ingredients. Another strong course, the pork belly had a wonderful balance of lean meat and fat broken into layers running horizontally across the meat. 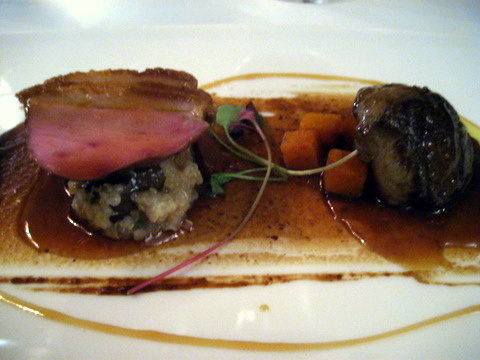 I don't recall much of the other ingredients on the plate as I had focused on enjoying the rich fattiness of the pork. 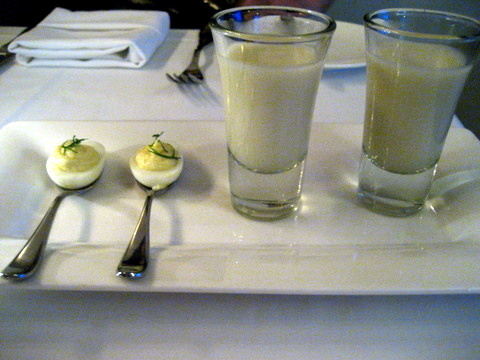 Okay I swear no more courses contain pureé of any sort. Thats probably because this is the last savory course and my favorite course of the night. Unlike so many beef ribs I have eaten recently this one wasn't slathered in a thick tangy layer of sauce. Rather the meat had a distinctly Asian flavor with hints of licorice. The addition of crispy spaetlze, think thick fried noodles like udon but denser and less springy provided a nice texture contrast. Adding Chinese broccoli made this whole dish taste like a gourmet beef noodle soup. The mustard yam pureé added a sweetness that went very well with the meat, given my disdain for yams, that compliment is high praise indeed. My girlfriend knowing me as she did knew I would love the beef course and after taking a single bite offered it to me in what I thought was a gesture of affection. No sooner had I tasted the beef, than she presented her terms, the lions share of the desserts. Seeing the enjoyment on my face she knew she had me trapped. With my head held high in what I hoped was an appropriately dignified manner I accepted her offer. Everything I had read suggested that the desserts at Hatfields were not to be missed we would soon find out if that were true. 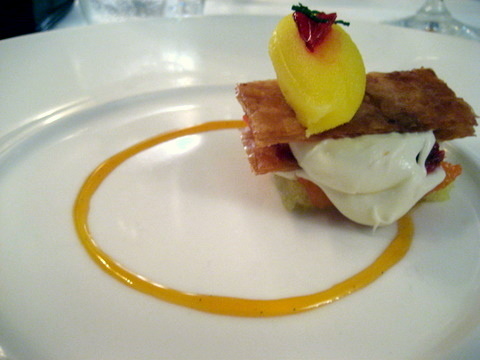 This dessert consisted of a base of almond cake, alternating layers of mascarpone and crispy phyllo. The tangerine sorbet was intensely concentrated tart and cold it was the perfect foil to the richness of the mascarpone and the sweetness of the almond cake. The crispy phyllo offered a buttery crunch to the softness of the other ingredients. Easily my favorite dessert of the night. Yes, my girlfriend was kind enough to leave me a bite of each dessert so I could write my reviews. This struck me as immediately different from normal panna cotta. 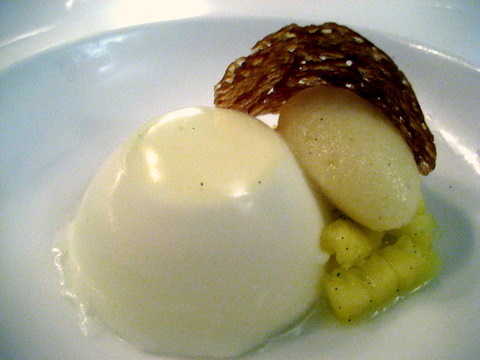 The use of buttermilk made for an extremely smooth and soft panna cotta with a hint of sourness not found normally. The pairing with pineapple made this another very light and flavorful dessert a close second behind the citrus napoleon. Personally this was the weakest of the desserts in my opinion. The tart was nothing to write home about the textures all tended towards soft and smooth with the exception of the coffee crumble. 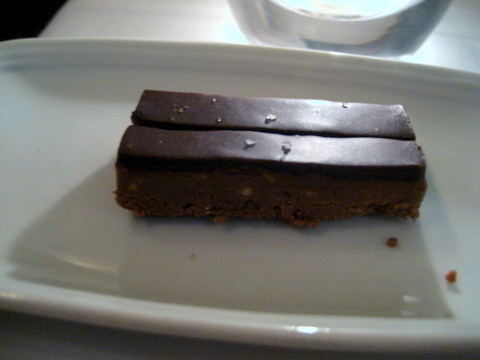 A very uniform and monolithic dish, somewhat dull given how good everything else was. It seems gourmet doughnuts are becoming popular among fine dining establishments, from French Laundry's Coffee and Doughnuts to the Doughnut Shoppe at Grace on Wednesday nights. I found these very similar to the doughnuts served at french laundry, sweet with a hint of cinnamon, the doughnuts were warm and of medium density, not as airy as say a Krispy Kreme but no where near the heaviness of a cake doughnut. Paired with this was a thick rich chocolate fondue for dipping and an aromatic vanilla and chai milkshake to wash it all down. Good but not quite up to French Laundry. 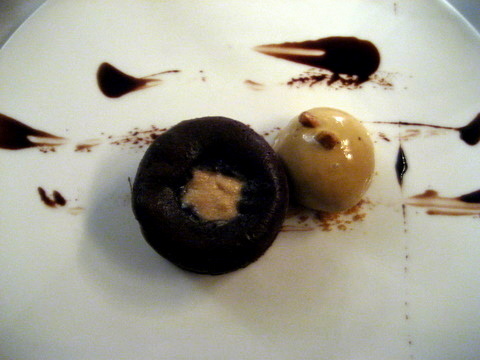 Another very heavy dessert, this was in essence a molten chocolate cake mixed with peanut butter. 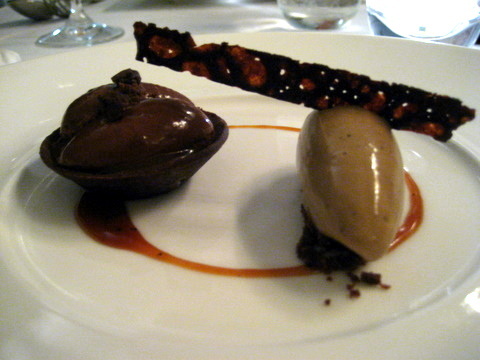 The salted caramel ice cream added a significantly different flavor to the dish. Normally I find molten cakes paired with vanilla or something else bland but creamy in an effort to dilute the richness of the chocolate. Here, judicious application of salt and the pleasing burnt flavor of toffee enrich the dish without trying to mask the intensity of the chocolate. Yet more chocolate to end the meal. Fairly good, definitely comparable to any high-end chocolate. I can certainly see validity to supporters who enjoy Hatfield's food, the dishes are all fairly solid and a couple are standouts in my mind. This is one of the rare times I found the earlier seafood oriented courses significantly weaker than the later poultry and meat courses. 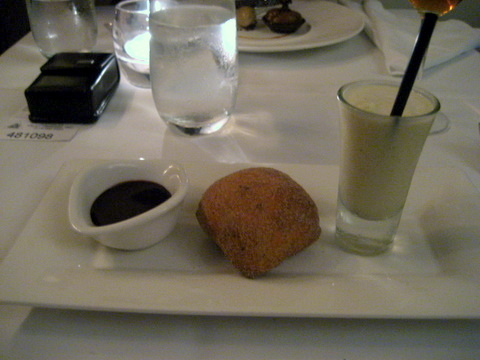 Even those were overshadowed by the desserts which I find normally pale compared to the savory courses. At the same time I certainly can see the point of detractors as well. Some of the earlier courses, while carefully prepared seemed to miss the mark. Not going with the tasting menu, one can easily pick a couple of weaker courses and end up with a poor impression of the restaurant. To sum it all up the food here is strong but lacks a certain polish that sets it apart from the truly great restaurants in my mind. That and maybe ease up a little on the pureé. Tsukiji, named for the famous fish market of Tokyo has long been one of my favorite restaurants for sushi. My first time there was a few years ago now, but I remember the fish quality was perhaps the best I had ever tasted. Subsequent experiences have eclipsed Tsukiji, but I still think Tsukiji offers some of the best bang for the buck in terms of fish quality. I took my girlfriend here once or twice and it has become one of her favorite sushi restaurants. Our first trip we had some fish from Japan that we both felt was incredible. A truly different experience from most other places. On a subsequent visit, we were served the "special toro" seared toro with onions and a special sauce which ranks among the strongest toro I have ever had. On our latest trip we were saddened to see that nobody else was at the restaurant when we walked in. I expected the place to be busier on a Saturday night. Happily by the time we left there were two or three other groups dining in the restaurant. 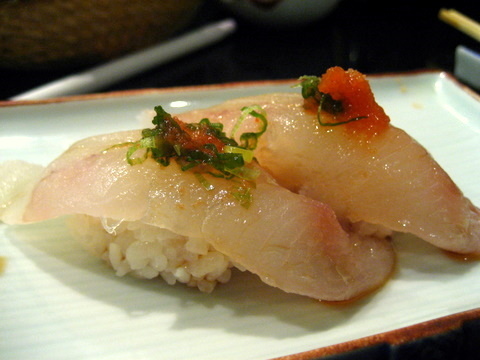 Ah always a safe bet Hamachi from Japan, this is what I expect when I dine at Tsukiji. 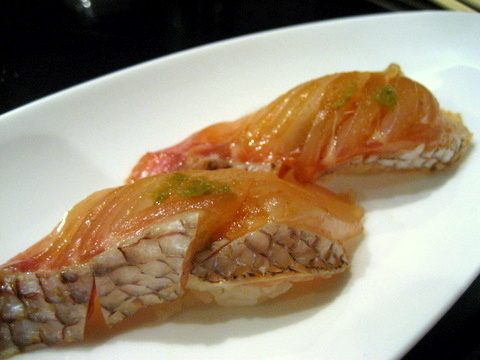 The fish was exceptionally fresh with a firm texture and the characteristic yellowtail flavor. 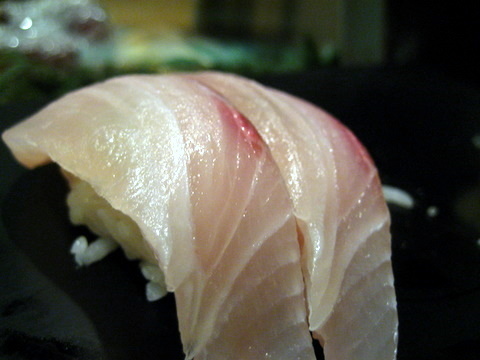 Simultaneously with the hamachi we ordered kanpachi. I asked the chef what the difference between the two was. 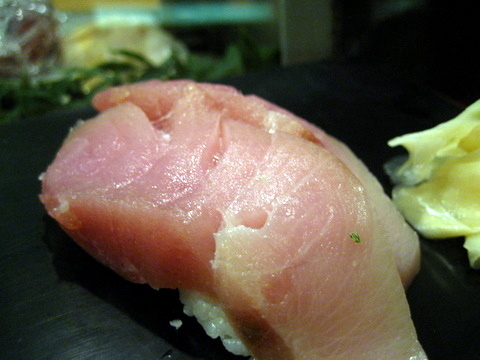 Previously I assumed Kanpachi was simply baby yellowtail but the chef said it is a cousin of yellowtail. The texture is a bit firmer although the flavor is similar if a bit lighter. Another gift that went perfectly with my beer, shisito peppers stuffed with spicy tuna and fried. 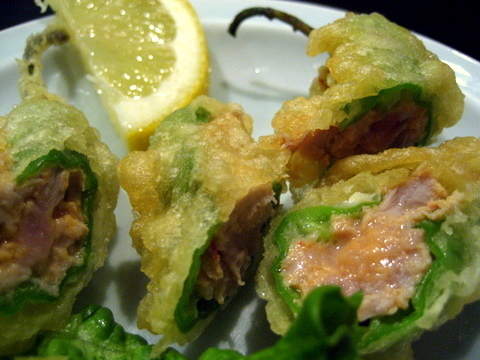 The shisito flavor was largely lost due to the frying but there was a hint of the tuna left. An interesting and enjoyable course, but just like the other free course I could have done without it. A fairly representative hirame, firm and a bit chewy a very meaty texture. 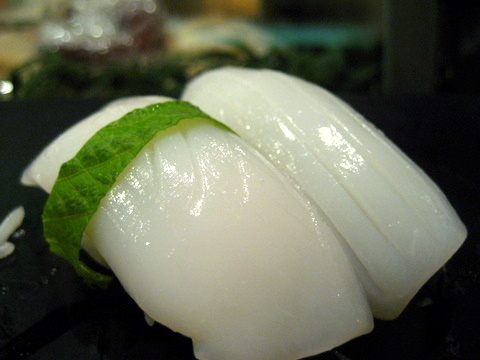 Wow an amazing ika, briliant white color balanced with a stripe of green from the shiso leaf. Upon biting down one notices the exquisite texture, the perfect balance between firm and creamy. Last time we were here, when we ordered toro the chef offered to make his special toro which we thought was phenomenal. Naturally we had to try it again. Sadly this time there was no O-toro so he used Chu-toro. 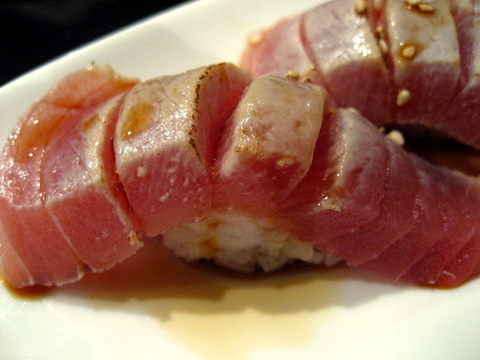 The fish was significantly leaner, not even really good chu-toro. With high fat content the searing melts the fat, making the fish even more tender than normal. 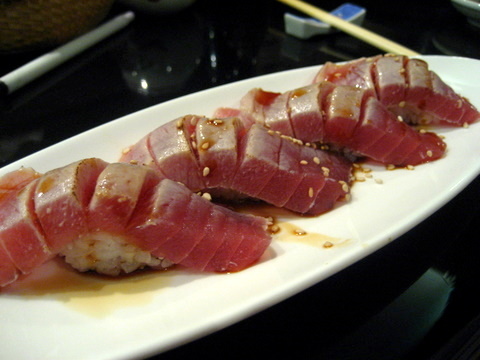 Since this was so lean, there was no tenderizing effect, this fish simply tasted like seared tuna with none of the richness of our previous experience. When asked how we liked it my girlfriend, who hesitates to criticize anything, had to shake her head. The chef seeing our disappointment agreed the fish was too lean and offered us a discount as an apology. 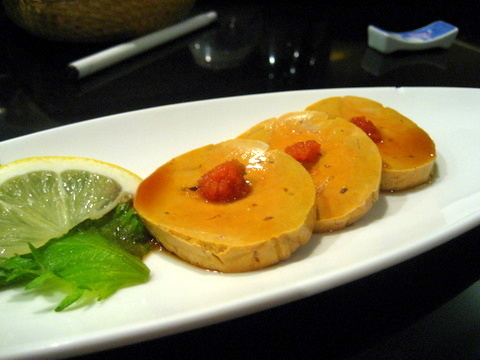 Once the specialty of the restaurant, the quality of the uni has remained high. The texture was incredibly soft and creamy although there was a slightly bitter tang on the aftertaste. Another lost delight of trips past. The hotate this time had none of the slick tender texture or subtle sweetness of our first experience here. Midway through the meal, we asked the chef what was good he recommended the Tai and the Hirame. Wanting one last piece, we went with the Tai. He again offered his special take on the tai, using a different soy sauce and dabbing it with yuzu kocho. This was incredible. The firm resistant feel of the tai with a bit of citrusy heat. Delicious, I just hope its the same next time around. 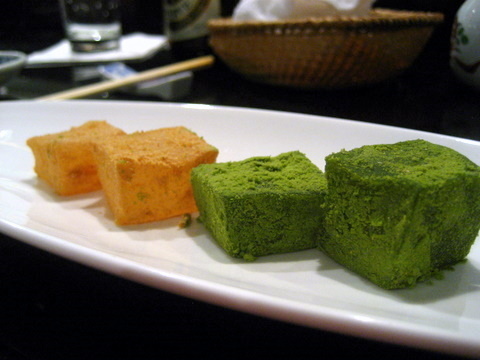 A third little give away, green tea and sesame flavored mochi-like squares. I tried the sesame one, the flavor wasn't very intense but definitely present along with a slight sweetness. The texture wasn't quite like mochi, soft but less sticky, slightly chilled and very refreshing. One good thing about being the only diners in the restaurant is the attentive service. We received amazing 1-on-1 service from the chef who runs the sushi bar and his wife who acts as hostess/waitress. The restaurant just changed hands, and the new owner is actually the former assistant. I recall he was our sushi chef the last time we were here. He is much more jovial than the previous owner, laughing and joking with patrons. Tsukiji has definitely lost some of its luster. I suspect the lack of customers has something to do with the downward slide. The food used to be faultless, now there are some hits and misses. Despite the misses, I still very much enjoyed some of the food. I hope we just went on a slow night, because I really like the chef and his wife and wish them all the best. I will definitely be back in the future to see how they've fared.